Democratic presidential hopeful Andrew Yang is making a name for himself on the campaign trail with a radical plan to provide all Americans over the age of 18 with $12,000 of income annually from government funds. He often points to one state that has had a similar system in place for decades — Alaska. Alaskans who have lived in the state for at least one full year are paid out a dividend — typically $1,000 to $2,000 a year — from the Alaska Permanent Fund, which was established in 1976 and is worth in excess of $55 billion, replenished with the state's vast oil revenues. "It is wildly popular in a conservative state," Yang tweeted. "It has created thousands of jobs, reduced income inequality, and improved health for children." Yang told MSNBC’s Chris Hayes last week that his plan "would make children and families stronger, would improve our health, nutrition, graduation rates," as well as "help millions of Americans make transitions in this time of historic change." The historic change is what Yang, 44, a lawyer turned entrepreneur, sees as the coming wave of further automation that will make a number of industries, such as truck driving, obsolete. Critics like Robert Rector and Mimi Teixeira wrote in 2018 for the Heritage Foundation, a conservative think tank, that the payouts "would decrease work among the poor and increase dependence on government." But research has shown that the Alaska dividend has not caused people to drop out of the labor market, as critics of Yang's plan have suggested could happen with a national program. Instead, the influx of cash into the hands of Alaskans has led them to spend more and created a larger demand for labor. Ioana Marinescu, a professor at the University of Pennsylvania, and Damon Jones, a professor at the University of Chicago Booth School of Business, studied the effects of the fund on the Alaskan labor market by comparing trends in the state with similar states like Wyoming and Utah. What they found was that the employment level in Alaska has tracked with the comparable states since 1982, meaning that the dividend had no detectable impact on the Alaskan labor market. What's notable about their finding is that it conflicts with one of the major criticisms of Yang's "Universal Basic Income" plan: If people are receiving free cash from the government, they're less likely to work. "We were like, 'Oh wow, this is interesting,'" Marinescu told NBC News. "Not necessarily what we expected because economic theory tells us that when people get money, that should reduce their desire to work. We find that what likely happened here is that receiving all this cash meant that people were spending more at local businesses, and that's stimulating employment." The stimulation "about exactly balanced out any desire of people to work less," she added. "It comes down to, sure, some people want to work less, but on the other hand, there's more jobs." But could Alaska's system — serving a state with fewer than one million residents — be extrapolated to the U.S. at large? And for a much larger sum of money per person, too? 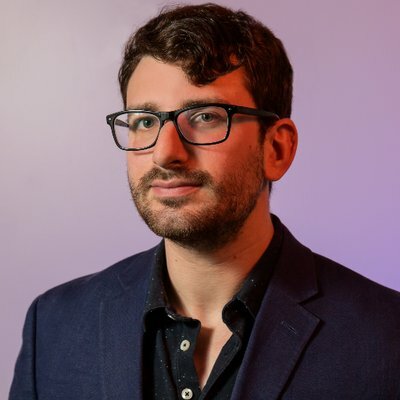 Max Kasy, a Harvard University economics professor who told NBC News he is "pro the introduction of a UBI" nationally, said the big question is how to pay for it. Alaska's fund is backed by the state's oil riches, while Yang proposes funding his UBI plan with a 10 percent value-added tax, a carbon tax and reconfiguring some existing social welfare programs. Kasy said the VAT tax and the welfare rejiggering would be "effectively regressive, so the poor people pay proportionately more," adding that he would prefer using a higher income tax to fund a UBI. Marinescu added a carbon tax would be a "brilliant" funding mechanism. "There isn't a more appealing intellectual way to fund something like UBI," she said. "So if you are richer, you fly more, you have a 'McMansion', you have a big car ... you tend to use more carbon." 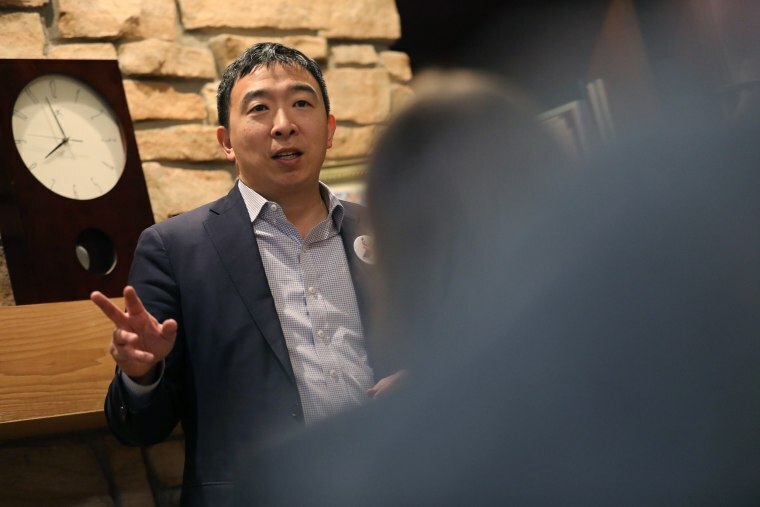 Alaska state Rep. Jonathan Kreiss-Tomkins, a Democrat, said he could see a plan like Yang's being instituted nationally if the political will existed, adding that it would possibly be one of "the most major societal and political shifts in U.S. history." Currently, the major debate surrounding the Alaska fund involves how much of it will go toward providing public services. The state's governor, Mike Dunleavy, a Republican, wants to significantly slash those services while paying out larger sums from the fund to residents, and Democrats have pushed back. On his campaign website, Dunleavy criticized his predecessor as governor, Bill Walker, an independent, saying he "raided the Permanent Fund and took half of your (fund dividend) to pay for bloated state budgets." "The (dividend) belongs to you and your family — not to him," he added. As someone who knows Alaska's system firsthand, Kreiss-Tomkins said it's "really appropriate" for Yang to push the conversation about UBI onto the national stage, pointing to "the rapidly evolving conversation around the future of work and automation." "I'm really glad he's running for president and he's talking about this," he said. "The practicability of this is another conversation."